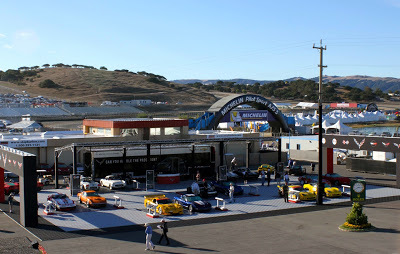 MONTEREY MOTORSPORTS REUNION: LAGUNA SECA! 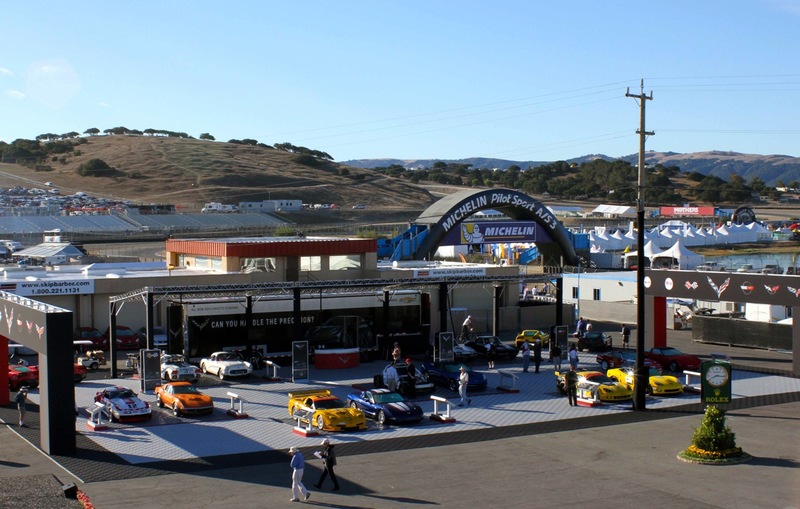 Mike Matune focuses on Motown Metal & Fiberglass at the Rolex Reunion Races at Mazda Raceway Laguna Seca. Corvette was the featured Marque at the Motorsports Reunion this year, and did it ever bring out the crowds. 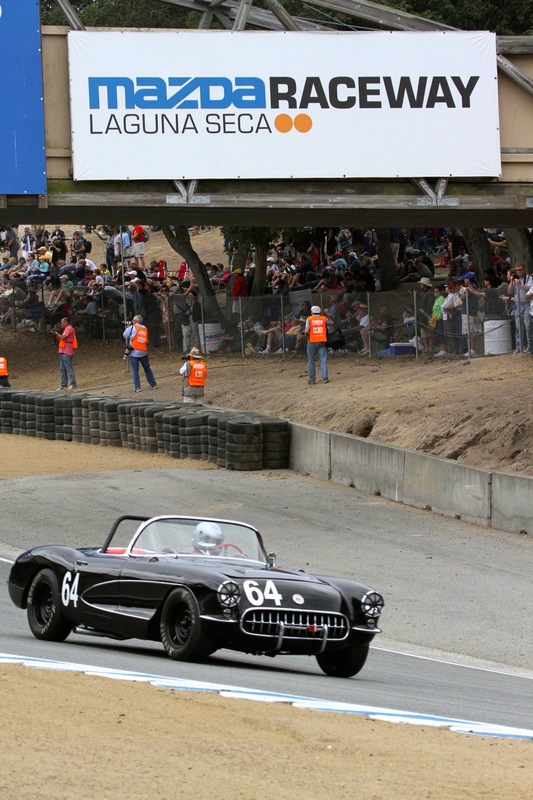 Here Les Alexander drops down the hill towards Turn 9 in his ‘57 Corvette, left. 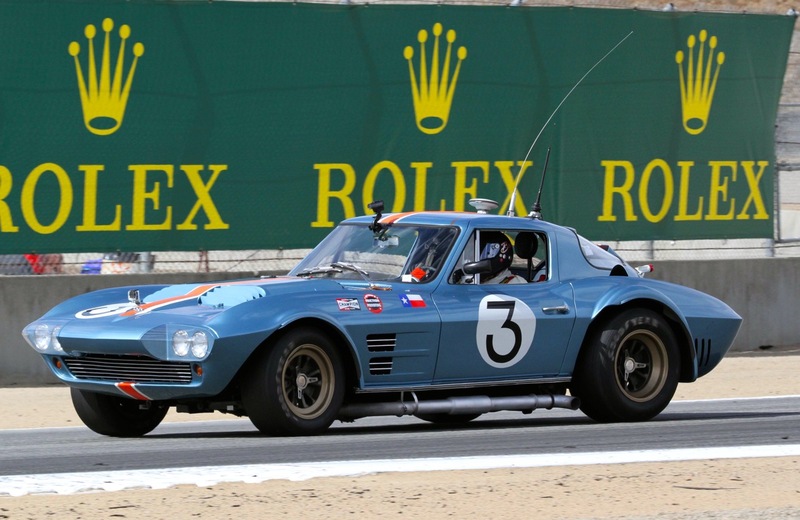 As with many early cars, Alexander’s car has lived through a number of iterations and been resurrected more than once, including its latest foray into vintage racing. 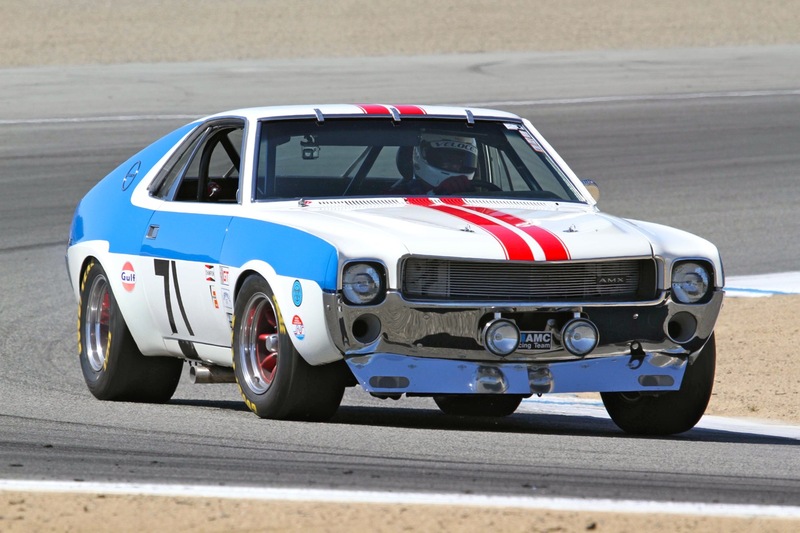 Back in the day, it was a successful SCCA racer in the Midwest in the hands of Lew Draper. Top photo triggers that old “what might have been” feeling. 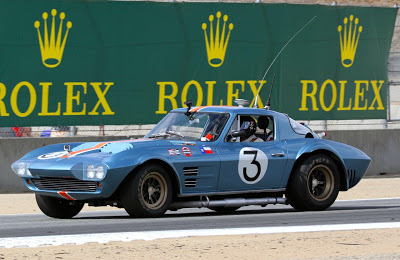 Bruce Canepa in the Collier Collection’s Corvette Grand Sport flashes by the Rolex banners in Turn 2. What if GM’s Chairman Frederic Donner hadn’t confirmed GM’s compliance with the AMA racing ban in 1963? What if Zora Duntov had been able to bring the Grand Sport to production status and been able to compete head to head with Shelby’s Cobras? The Grand Sport had certainly proved its mettle at places like Nassau, frequently in the hands of privateers with limited factory support. 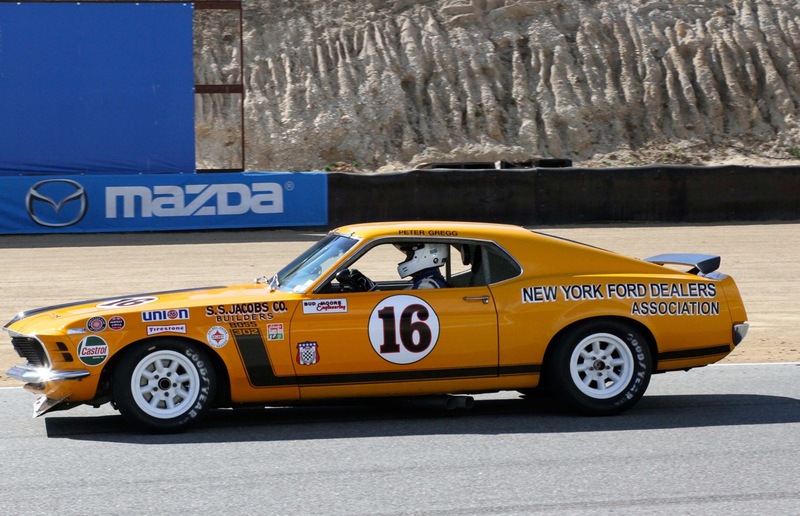 Could they have successfully challenged the Ford backed and powered Cobras? technology transfer among the two. 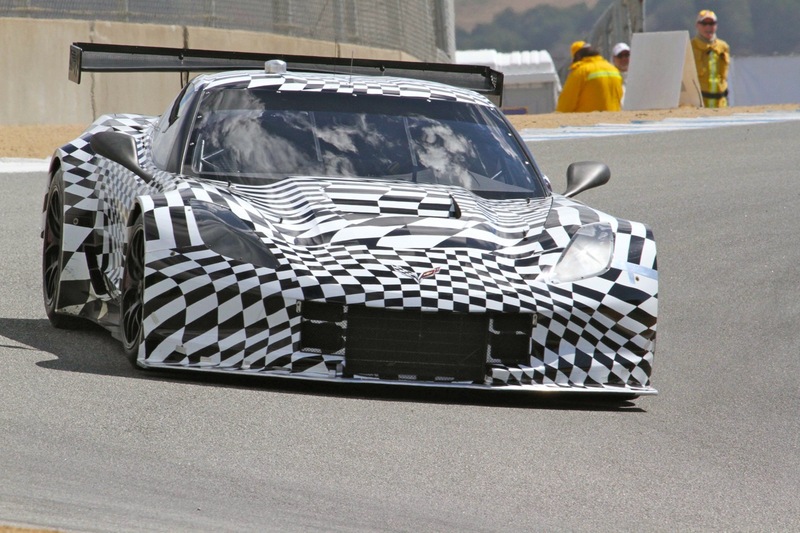 Chevrolet used the occasion of being the Featured Marque at this year’s Reunion to give everyone a sneak peak at the C7R. There was no prior announcement of the laps taken by Tommy Milner in the still-camouflaged car. I have to say I probably would have missed it too, if Peter Brock hadn’t mentioned to be track-side with camera at the ready earlier in the day when I stopped by to renew our acquaintance in the BRE tent. Even a SCRAMP official I spoke with later in the day said they only knew a car would be on track during the “Corvette Pace Laps”. 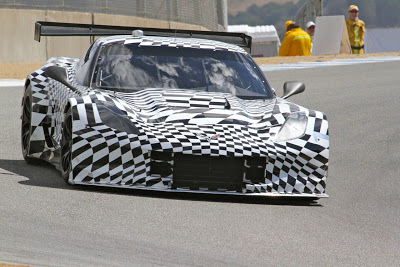 He allowed as he knew it would be special based on the secrecy involved, but wasn’t prepared for the C7R. The car came out of a transporter, onto the track, ran its laps, disappeared back into the transporter and disappeared. It was awesome! is comfortable with its life as a vintage racer. The Trans-Am series was wildly popular in its day and remains so today. When these cars take to the track, the crowd is drawn to the fence to watch a field of hairy, loud racers slide, shimmy, thunder, scoot, slither and rush around the course like animals just released from their cages. 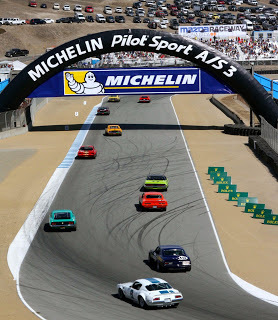 You can get any idea of the popularity of these cars as you look at the field pass through the straight, left, between Turns 3 & 4 on their way under the Michelin Bridge. Pontiac was among those manufacturers hoping for a slice of the Ponycar market dominated by Camaros and Mustangs.. They would first come to the series with a Chevy-engined Firebird, claiming that all Canadian-built Pontiacs were powered by Chevys. 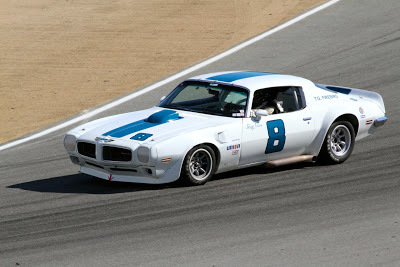 Later they would use their own powerplant and name the car at the peak of Firebird performance after the series itself. The late, great Jerry Titus left Ford and drive for the team. 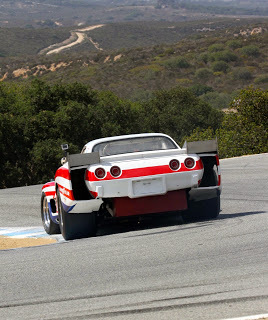 The zenith of the Trans-Am is generally considered to be the 1970 season when all the U.S. Manufacturers fielded fully-backed factory teams. Ford would come away the winner that year with Bud Moore prepared cars driven by George Follmer and Parnelli Jones. The next year everyone but AMC withdrew. Bud Moore would soldier on as a privateer with sponsorship coming from a package put together by Peter Gregg. While achieving some success they were no match for the Penske/AMC juggernaut that swept all before it and took the 1971 crown. Here Jim Hague takes Gregg’s car, now owned by Ken Epsman, up the Start/Finish straight. 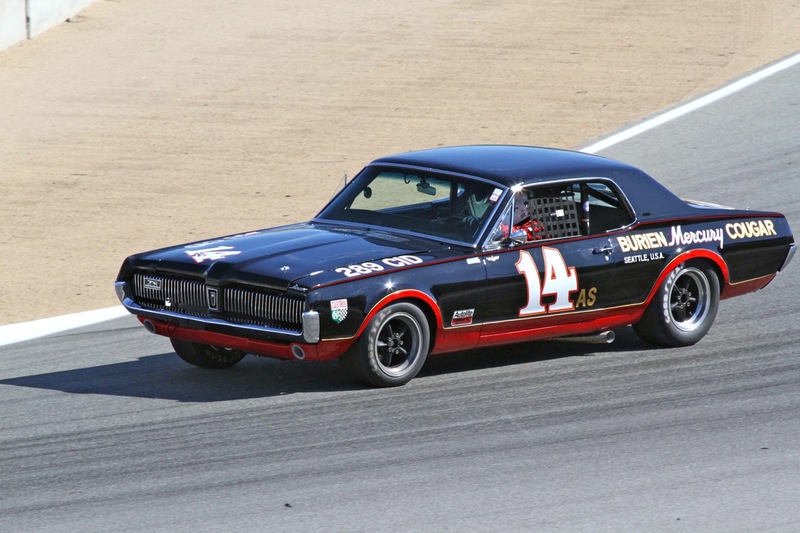 Even Mercury got into the Trans-Am act, nearly winning the 1967 Title before leaving the series to stable-mate Ford. Here Ike Keeler bends his ‘67 Cougar into Turn 3. 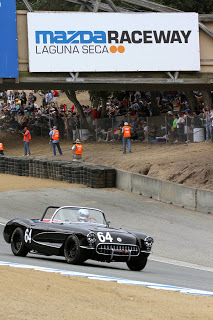 Here exiting Turn 2, Didier Andre, right, drives one of my favorite racing Corvettes. John Greenwood built these fat-fendered, wide-bodied and winged cars and contested races around the world. With big, thumping Chevy big-blocks, outrageous bodywork and eye popping paint schemes; they certainly were a treat for the senses. They kind of epitomized the Corvettes of that era; big, fast, loud and about as subtle as getting hit with a sock full of nickels! 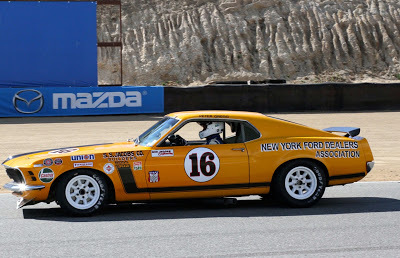 For more on John Greenwood’s fast and furious cars, see John Zimmermann’s article “Twisting in the Wind” in the September, 2013 issue of Vintage Racecar magazine. 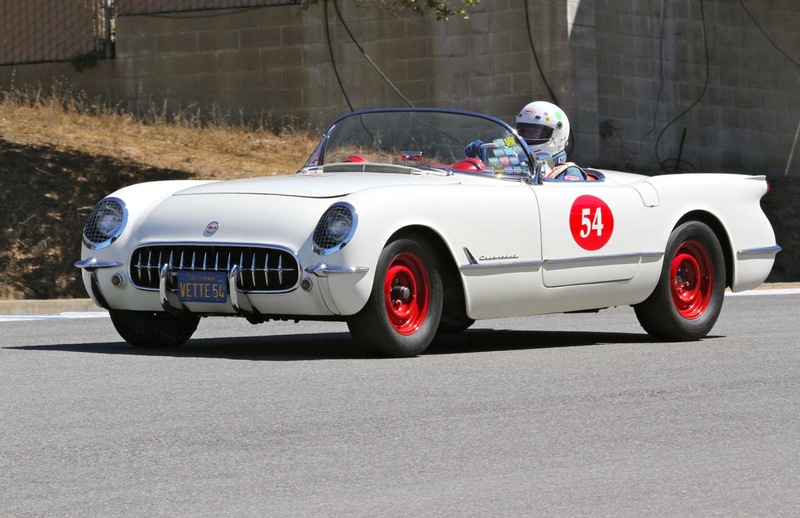 If I got this right, the oldest Corvette in competition was Richard Ravel’s 1954 model. Just as was customary when this car raced, it is little removed from street trim, complete to a license plate, full headlights and windshield, etc. Powered by a Blue Flame Six, it shows GM’s thinking as to what was “sports car” in the early-1950s. 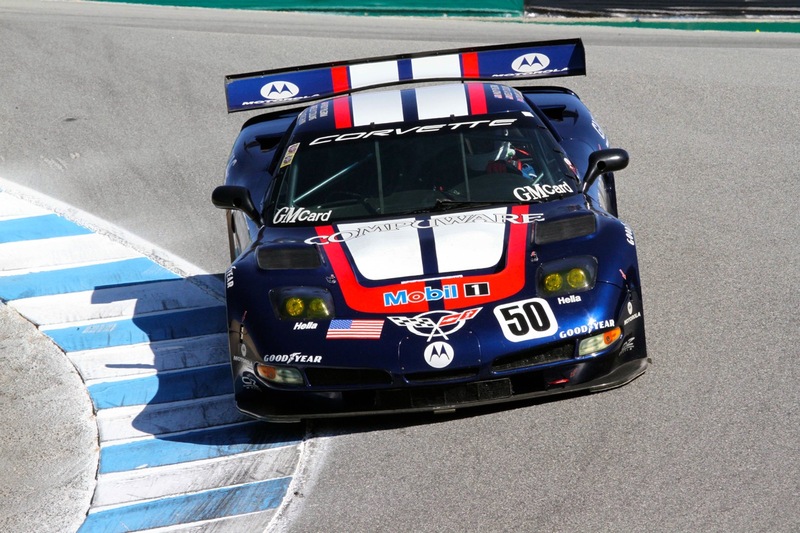 Contrast Ravel’s car with what was the newest Corvette in Reunion competition, George Krass’ ‘03 Corvette C5R seen here coming into Laguna Seca’s trademark “Corkscrew.” A Le Mans veteran, Krass’s car bears only a passing resemblance to the street version. It is pure racecar. And what did the nearly fifty years intervening between Ravel’s and Krass’s cars get us in terms of performance? According to Laguna Seca Timing & Scoring, Krass’s best lap was in the 1:32 range while Ravel was nearly a minute slower at 2:21. PHOTOS & WORDS: M.M. “Mike” Matune, Jr.